If arrested for DUI, should I take the breath test? As a lawyer who handles many DUI charges, this tops the list of frequently asked questions regarding DUI. Below are some important things you need to know about the breath test procedure, your rights, and the potential consequences of your decision to take or not take the breath test. It should be noted that Emma's Law, an amendment to South Carolina's DUI law, will take effect Oct. 1, altering the potential consequences of a DUI breath test refusal. If an officer believes he or she has probable cause to arrest for DUI, the officer can and will ask you to take a breath test. 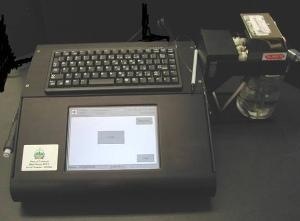 This test will take place at the police station or county jail in a room dedicated specifically for breath testing using the Datamaster machine (pictured right). Officers do not do "roadside" breath testing in DUI cases in South Carolina. First, it is a choice. You have the right to refuse the breath test. A refusal alone will not subject you to additional criminal charges. However, when you applied for your South Carolina drivers's license you gave your "implied consent" that you would submit to a breath test if asked by a police officer. Under South Carolina law, if you refuse the breath test your license is automatically suspended for six months and the officer will confiscate your South Carolina license immediately. Before your license can be reinstated, you must apply for South Carolina's Alcohol and Drug Safety Action Program (ADSAP). The cost of this program is $500 minimum and can be as much as $2,500 depending on your previous record. However, you have the right to request an administrative hearing to contest the suspension. This must be done within 30 days of your suspension. Once the suspension is contested, you usually can obtain a Temporary Alcohol License pending the outcome. When we help clients appeal their license suspensions they are usually driving again with a Temporary Alcohol License in about a week. If you do not appeal or lose the appeal, your license will be suspended for six months and you may be able to get a route restricted license during that time. First, you can quickly get a temporary license with full driving privileges and no route restrictions. Second, if you win your appeal, which can and does happen, you'll have your full license restored and avoid the cost and hassle of ADSAP. What Happens If I Take The Breathalyzer Test? If you take the breath test and register a blood alcohol content (BAC) of 0.15 or higher, your license will be suspended for one month with the same ADSAP requirement. These suspensions can and should also be contested. If you take the breath test and register anything above a 0.05 BAC, the State may have evidence that will give rise to an inference that your faculties to drive a motor vehicle were materially and appreciably impaired. So, remember that you have a choice and, if you refuse, there are options available to keep your driving privileges. Our DUI Lawyers handle DUI charges in Charleston, Mount Pleasant, Isle of Palms, Sullivans Island, Folly Beach, North Charleston, Hanahan, Summerville, Goose Creek, Moncks Corner and the surrounding areas. Give our Charleston DUI Attorneys a call today to discuss your case free of charge.